Looking for space to store your things at home? Everything you own is competing for space in your house. Everyday items, such as clothes and exercise equipment, along with seasonal things like pool toys and Christmas decorations, are taking over your limited square footage. Don’t let the space under your bed go unused or gather dust. Buy some plastic bins and use them to store seasonal items such as winter clothes. Put your heavy sweaters in them during warm weather, and switch them out with your bathing suites and shorts during colder months. If you have more space under your bed, store shoes, linens, blankets and other things you don’t need every day. 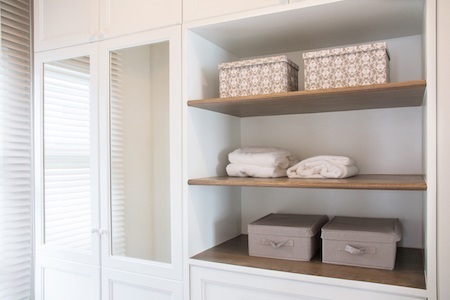 Some clothes are bulky and can take up a lot of room in a drawer or closet. Vacuum storage bags are sold at home supply stores and can hold your winter clothes for a few months. Use your vacuum cleaner to remove the air and collapse the bag. They can also be used for other bulky items like comforters, sheets, blankets and towels. This hanging organizer can look like something out of your old dorm room, but it still comes in handy. Hang it over the back of your bedroom door to store shoes, baseball hats, belts, scarves and jewelry. You may not notice them immediately, but there are probably tangled charging cords all over your house. They don’t usually cause a huge storage problem, but they create clutter and can be ugly to look at. Buy a charging station that can conceal the cords and keep your phones and other electronic devices accessible in an area that looks pleasant. A garage can easily become one of the most crowded areas of a house. Clean it up by putting things in bins, donating what you don’t need and hanging a peg board to hold your tools. Everything should have its own space, especially in the garage where things can get cluttered quickly. Use a thick marker to draw an outline on the peg board for each tool. When you see an outline without its tool in place, you’ll know that a tool is missing. It should also help you put tools back where they belong after using them.